Link's Awakening belongs to the butter zone of Game Boy titles -- after developers learned how to harness the system, but before they needed to resort to color and gimmicks and prerendered "3D" bit-art to stay relevant. 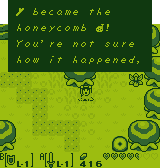 The aesthetic is very much reminiscent of SNES Link to the Past, a title from which the game also borrows as many mechanics and items as it can. In fact, playing it, it feels much more like an SNES title than Game Boy, apart from the occasional lag in gratuitously sprite-heavy situations. As with a number of cream-of-the-crop games of the period, you can find your brain filling in SNES colors for the grayscales, which is why in some ways I prefer playing the original over the Color DX re-release -- which pounds explicit hues out of the system's NES-caliber palette. The soundtrack is varied and memorable, if only par for the system on complexity. As a side-note, it's one of the simpler games in which to find composer Kazumi Totaka's signature two-dozen note easter-egg (while you're puzzling that one, go ahead and Google "Kaeru no Tame ni Kane wa Naru"). 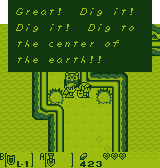 Speaking of easter-eggs, this game is peppered with remarks referencing other goings-on in the Nintendo universe, as well as unexpected commentary triggered by using certain items or investigating certain scenery within specific windows of plot, all of which make the play experience more engaging. Link's Awakening also originated some less abstruse game elements like the extended trading sidequest, multi-function ocarina, cinematic parting of the waterfall, recurring guide character, and likely others I'm missing that have since become series staples. I first played Link's Awakening in grade school, where it accompanied me on various family car trips. I've since returned to it from time to time, racking up two or three full completions. Yet, even knowing it mostly inside and out, and coming back to it as a trained game designer, it still draws me in enough to lose 2-3 hours at a time before I think to check my watch and make sure I'm not missing anything in the real world.